Situated in Hostel Terra Vista you can experience traditional village life while still enjoying the comforts of modernity. We welcome all kinds of travellers and want everyone to feel at home in our hostel. We have bed & breakfast service and we always try to keep our rate lower for you. Our aim is that all our guests leave us with a smiling face. 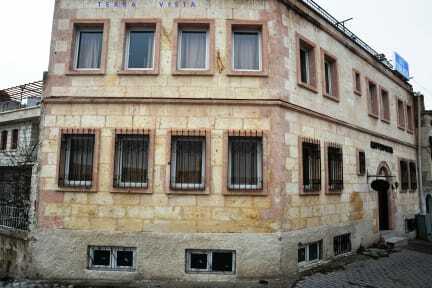 Hostel Terra Vista is located on the main street in Goreme and it s only 100 metres faraway to bus station. We provide free information about Cappadocia and maps and can book tourist activities for you such as, Turkish nights, horseback riding, tours of Cappadocia and hot air balloon trips. We have a rooftop terrace where you can watch the balloons rise from the bottom of the valley and gently float across the blue Cappadocia sky and sunset. Other facilities include a cave lounge full of cushions perfect for lounging in the winter curled up in front of the fire with a good book or sharing a bottle of wine with your neighbors. Earliest check in time is 11:00 am, if your room is available before it can be possible to check in earlier! Airport shuttle bus service to hostel & from hostel which is 25 TL- 30 TL per person for one way. Price depends on which airport. Reception open from 8:00 am to midnight. It's the most perfectest hostel I have ever stayed at. The staff is extremely helpful and nice, the location couldn't be better and the price was unbeatable. I enjoyed the social tea hours with a lot of wonderful people (yeah, this hostel somehow attracts the coolest ones). I felt like every guest was treated as an individual and not just some random tourist. Thanks a lot! Stuff is really friendly and helpful. You have an amazing view from the terrace and its super close to everything, would stay there again! Breakfast was good, stuff was very nice and helpful, it is located right in the heard of göreme! I would definitely stay there again!